(Reuters) - General Motors Co said on Thursday that Mark Reuss would succeed Dan Ammann as president, effective immediately, as part of the automaker's ongoing shift to electric and self-driving vehicles in North America and China. Reuss remains focused on rebuilding the Cadillac brand and streamlining GM's product development operations, while doubling the resources, mainly engineering hours, allocated to electric and self-driving vehicle programs in the next two years, the company reiterated. GM has budgeted $8 billion for the development of electric and self-driving vehicles, with SoftBank Group <9984.T> and Honda Motor Co <7267.T> pledging to invest $5 billion in GM's Cruise self-driving unit. 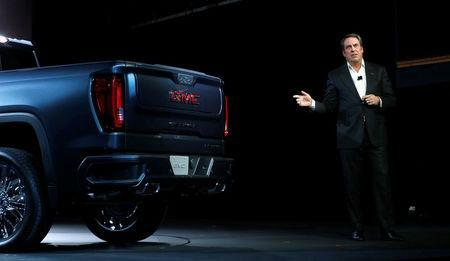 Ammann became chief executive officer of GM Cruise, the self-driving car unit, on Jan. 1. The appointment of Reuss, a 35-year GM veteran, comes as the No. 1 U.S. automaker cuts back on producing traditional sedans. In the United States, GM remains strong in pickups and utility vehicles, which accounted for two-thirds of the company's sales in 2018.